The Best Avocado Toast Ever. Recipe. How to cook? Now avocado has become so popular, yummy little recipes are popping up everywhere! Avocados serve so many healthy purposes for us that we shouldn’t be afraid of eating them. Even though they are 85% fat, the fat is all natural, beneficial, plant based fat. Essential for our brains, anti inflammatory and a plethora of other reasons. This toast recipe is super simple and you can easily substitute different cheese or veggies if you can’t find the ones from recipe. Toast your bread to the color you like it. It’s totally up to you. In a small bowl with a fork, mash the avocado and add a little salt. 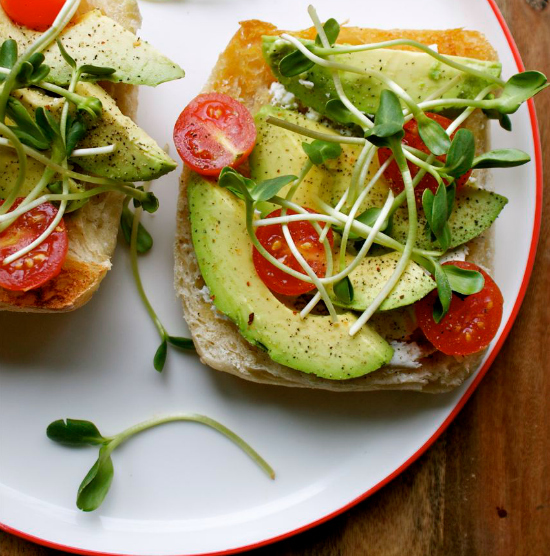 Spread the avocado mash on the toast, top with the sliced tomatoes, crumbled cheese and pea shoots. Add a little S&P to taste and you are all ready to indulge!